On top of all their regular deposit bonuses and raffles, Grande Vegas Casino is getting in the Christmas spirit with its Message Center Advent Calendar. Each day until Christmas, when they log on and check their casino messages, players will find casino bonuses and other holiday treats such as tournaments, recipes, poems, Christmas-themed games and festive surprises. Counting the days until Christmas has never been this fun. Although Grande Vegas has more than 300 casino games – slot machines, video poker and table games like Roulette and Blackjack – the new 50-line Monster Mayhem slot machine has been one of the most popular since it launched recently. It features a giant reptile making its way through a city, and an enormous pink rabbit and a hulking orange cat stomping and crunching their way through the urban jungle. The giant, animated city beasts “Smash” and “Crash” trigger a re-spin feature and there are randomly triggered Minor and Major jackpots. 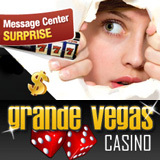 The three million-dollar jackpot slots at Grande Vegas are also very popular. Jackpot Pinatas is nearly $1.7 million, Aztec’s Millions is over $1.3 million and the Midlife Crisis/Shopping Spree jackpot has topped a million. Cleopatra’s Gold is over $280K. The total jackpot pool currently waiting to be won is an incredible $6.2 million.